Last night, I got about 4 lbs pasta dough mixed and put in the fridge. Today, Mrs. Davesbeer made the cheese mixture. I rolled dough, the kid stuffed and the Mrs. cut. About 200 made in about 2 hours with a side of noodles for the upcoming week. Now, it's off to Studio 35 for the new Jim Carrey Christmas Story. I love ravioli's! What kind of sauce are you going to make? Happy Holidays to You! Hey Chile, tomato sauce always. Sometimes I put them in soup. Homemade pasta is the best. Just did a Fennel and ricotta filled ravioli. 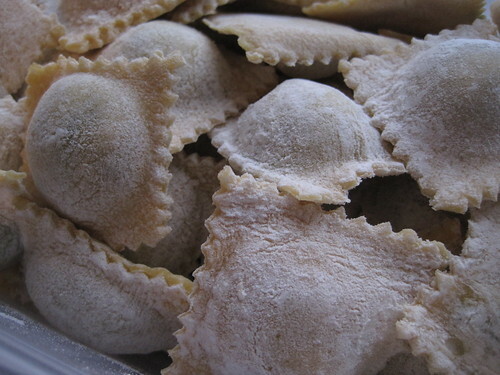 Your fennel and ricotta ravioli look pretty amazing.